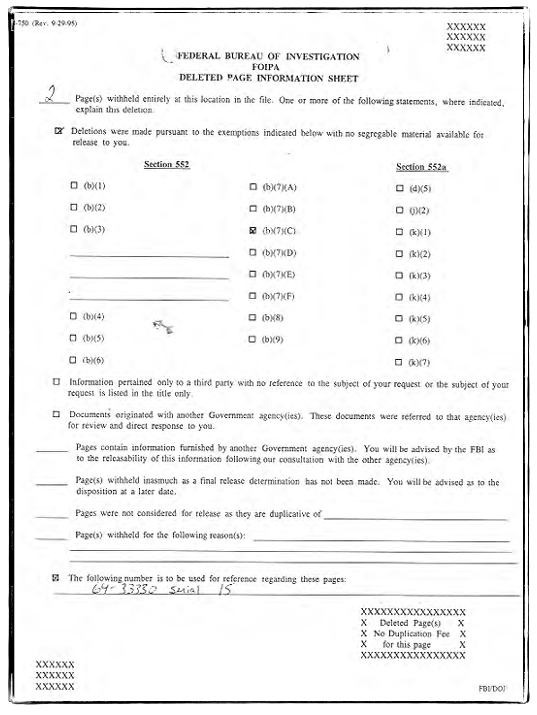 Todd Deam requested Burke's FBI Files in February, 1999. The Justice Department responded within several weeks to say that the files would be made available in "due time." Due time turned out to be only 45 days, in part because the files had been requested previously and thus didn't need to be censored again. 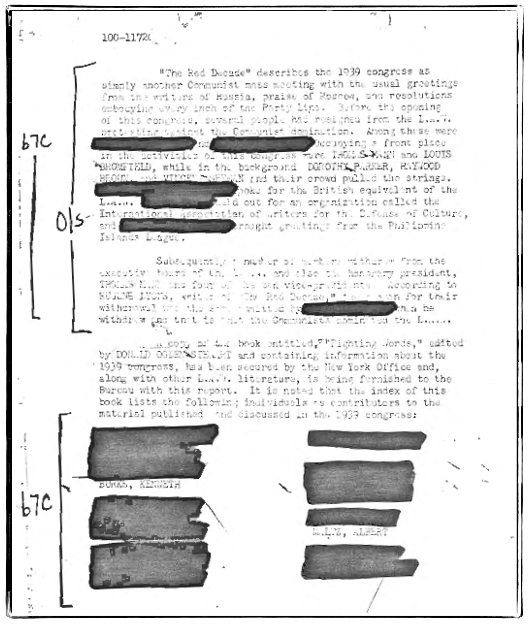 Perhaps the first thing that strikes the attention is the degree to which the documents have been censored. In many cases, items no longer readable will likely contain names of people involved in preparing the report or who may still be living and thus subject to having their privacy protected. This first document is one of nine to treat the four League of American Writers' (LAW) Congresses. Burke is known to have participated in the first three (1935, 1937, and 1939). 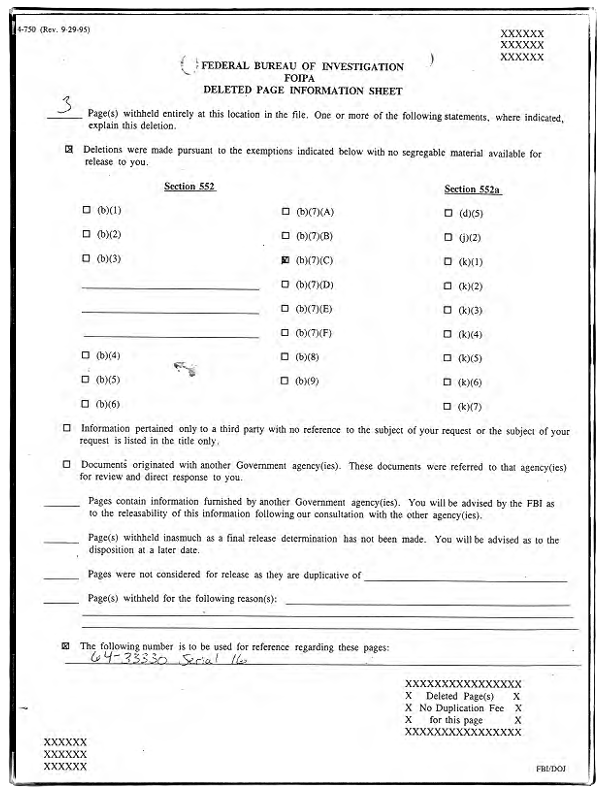 This first page of the report provides an overview of the LAW and identifies the content of the report, which appears to be a typical "brief" on the organization's activities. Seven lines from the bottom, the magazine Direction is mentioned. View or download the transcribed version of this page in PDF format. Burke published "Literature as Equipment for Living" in Direction in 1938, as well as a series of essays in 1941-42 on the emergent war: "Americanism." Direction 4 (February 1941): 2, 3; "Where Are We Now?" Direction 4 (December 1941): 3-5. "When 'Now' Becomes 'Then."' Direction 5 (February-March 1942): 5. "Government in the Making." Direction 5 (December 1942): 3-4. This next document notes that much of the history of the LAW used to construct this brief comes from Eugene Lyons's The Red Decade: The Classic Work on Communism in America During the Thirties. New Rochelle, N.Y., Arlington House, 1991. See also Frank A. Warren's Liberals and Communism: The 'Red Decade' Revisited, 1966, rpt. 1993, NY: Columbia UP. Burke's name appears right above Erskine Caldwell's. This page concludes the discussion of the first LAW Congress, then begins the narrative of the second one, held in NYC from June 4-6, 1937. Burke presented the speech, "The Relation between Literature and Science," which is republished in The Writer in a Changing World, ed. Henry Hart, NY: Equinox Cooperative Press, 1937, 158-171. The LAW aimed in particular to fight the growing presence of fascist thinking in America and continued to ally itself with the Soviet Union, whose policies of repression under the Stalinist regime were rumored but as yet unsubstantiated in the U.S. It should also be noted that the aims of the LAW as published in the brochure preceding the Second Congress were not as specifically supportive of the Soviet Union as were those accompanying the First Congress. The aims in 1937 focus more on role of the writer as a cultural watchdog, a healthy culture being perceived as the best defense against fascism. By this Second Congress, the aims of the LAW had become more focused on advancing the role of the writer as cultural watchdog. 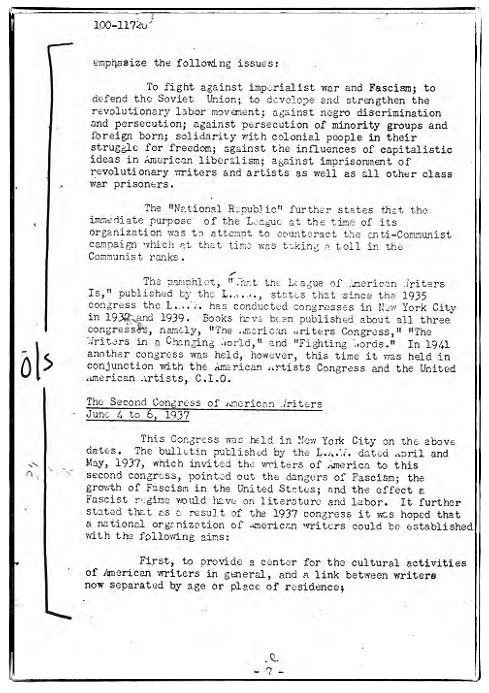 The reasoning was that, as stated in the bulletin announcing the meeting, a healthy culture was both the product of freedom of thought and expression, as well as the means of defending "the political and social institutions that make for peace," and by implication, of forestalling fascism's spread to the United States. There's is no mention here of the Soviet Union or Stalinism, as there was in the announcement for the First Congress. The LAW had begun to back off its support of Stalin amid widespread rumors of his repressive tactics. In hindsight, of course, we now know that these rumors turned out to be true. 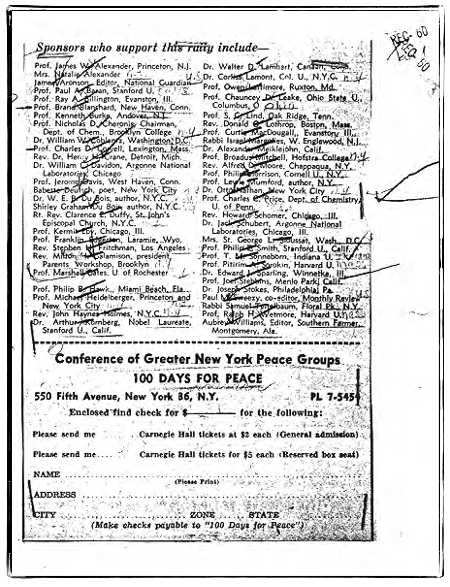 Burke is identified on this page as one of the individuals serving on an organizing committee "functioning to make the congress a success." The presence of fascistic thinking in America was of great concern to Burke, as was evidenced in his famous "The Rhetoric of Hitler's 'Battle,'" which was delivered at the Third Congress in June, 1939. The speech was a scaled back version of the essay Burke had already had accepted by The Southern Review and that would appear a month later in July, 1939. This essay also appears in The Philosophy of Literary Form, 1941, rpt. Berkeley: U of California P, 1973. In "The Rhetoric of Hitler's 'Battle,'" Burke describes his purpose as follows: "let us try also to discover what kind of 'medicine' this medicine-man [Hitler] has concocted, that we may know, with greater accuracy, exactly what to guard against, if we are to forestall the concocting of similar medicine in America" (PLF 191). 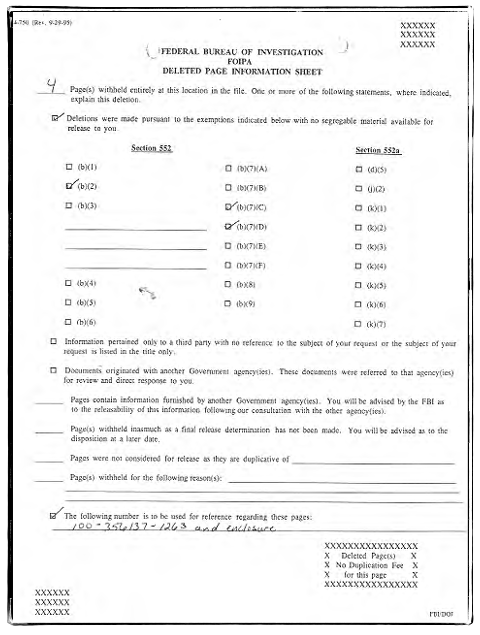 This page includes more names of people associated with the LAW. Burke is listed again, as are some of the following notable figures: Van Wyck Brooks (whose The Flowering of New England, 1815-1865 won the Pulitzer Prize for history in 1937); Erskine Caldwell (novelist; Tobacco Road, 1932); Lillian Hellman (dramatist; The Children's Hour, 1934); Muriel Rukeyser (poet; a key figure in the development of feminst poetry in the thirties), Upton Sinclair (The Jungle, 1906; Dragon's Teeth,1942); William Carlos Williams (poet, and Burke's longtime friend); and 29-year-old Richard Wright (Native Son, 1940; Black Boy, 1945). The tone expressed in this description of the 1939 Congress is one of optimism that various writers were withdrawing because the "Communists dominated the L.A.W." It is unlikely that Burke, whose name is still included at the bottom of the page as a "contributor to the material published and discussed in the 1939 congress" would have been one of those who abandoned the "cause" at this stage, having said in later interviews that he was not entirely persuaded to the truth about Stalin until well after World War II. Thomas Mann, one of the key figures at this Congress, was greatly admired by Burke, who was the first person to translate Mann's Death in Venice into English. Mann had won the Nobel Prize for Literature in 1929. 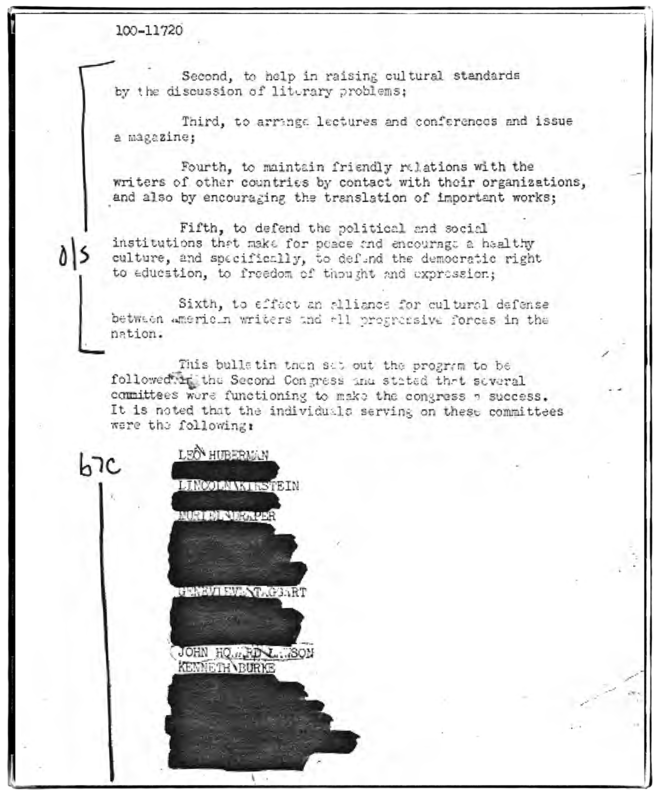 The next several pages of Burke's file include the "National Membership" of the League of American Writers for "the information of the other Field Divisions." 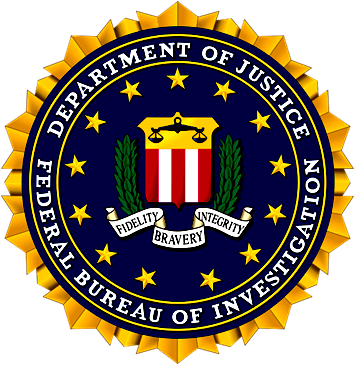 The FBI apparently desired to continute to track the activities of those listed. 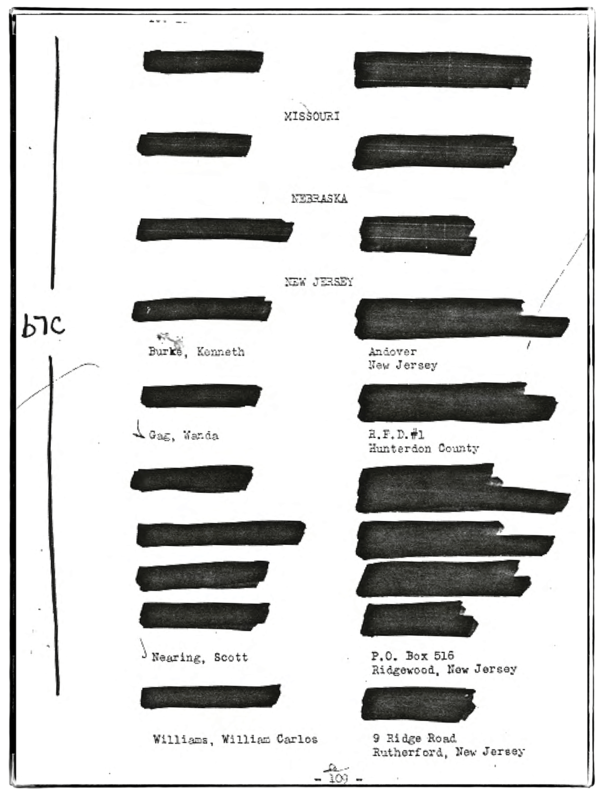 It's difficult to discern the reasons why so many names have been blacked out, while others remain untouched. Little information on John D. Barry could be found, though there was a San Francisco architect and author who died in 1942 and who may be the same person listed here. Burke's name appears on this page, along with his friend's, William Carlos Williams. Williams and Burke corresponded for over forty years. Their mutual influence has been discussed in such works as Brian Bremen's William Carlos Williams and the Diagnostics of Culture (1993), James East's, One Along Side the Other: The Collected Letters of William Carlos Williams and Kenneth Burke (Ph.D. Diss. U North Carolina, Greensboro, 1994), and in David Blakesley's "William Carlos Williams's Influence on Kenneth Burke," which is published on this website. Some of you may not know that Williams performed surgery on Burke 1945 to remove a "protuberance" from his mouth. About the incident, Burke writes, "But I was disgusted when you started talking down your next book, while I had such a face full of blood and gauze that I could not defend you against yourself. What bad advertising!" (Dec. 15, 1945; Beineke Rare Book and Manuscript Library, Yale University). Williams, of course, was quite pleased to be able to have all the final words on that day. 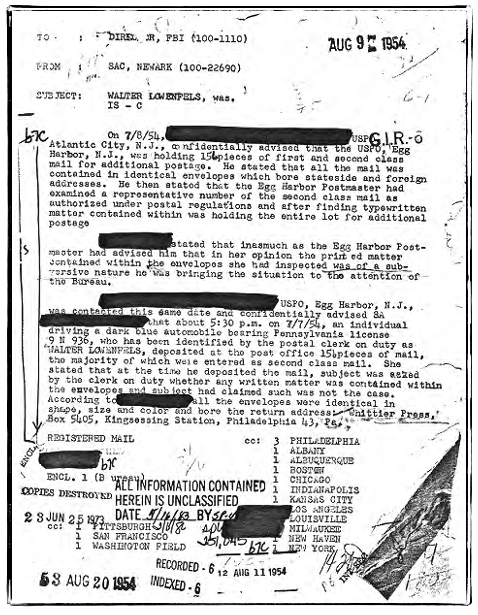 The subject of the next three documents in the files is Walter Lowenfels, whose shipment of 156 "pieces of mail" was seized by the Egg Harbor, NJ, Postmaster because of her determination that "the printed matter contained within the envelopes she had inspected was of a subversive nature." Burke, was one of the addressees. Walter Lowenfels (1897-1976) was an activist poet and prominent editor throughout his career. According to the dustjacket on his collection of poetry, Reality Prime (1998), he was "among the principal figures in 'the revolution of the word,' the movement to modernize American writing in the early years of this century. He broke major ground as a surrealist and as a politcal poet. Closely identified with Henry Miller and Anais Nin, he was a key figure in the Paris avant-garde during the 1920s and 1930s. After Lowenfels' return to the United States, he was jailed as a Communist. He was a familiar, radical presence in non-academic poetry." 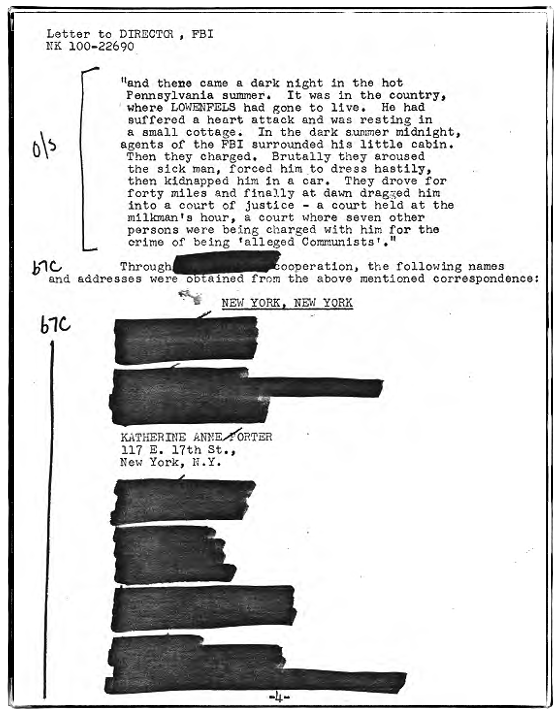 The opening quotation on this page describes Lowenfels's arrest by agents of the FBI. It is uncertain whether it is an account of the event that has been quoted from the material within the mailing (and perhaps written by Lowenfels himself). Lowenfels was editor of the Pennsylvania edition of The Daily Worker, which is likely the newsletter deemed subversive and seized. The oldest of "The Philadelphia Nine," Lowenfels was arrested and prosecuted under the Smith Act in 1953. The Smith Act, otherwise known as The Sedition Act, was used by the Federal government to prosecute Communists during the late forties and early fifties for "inciting the overthrow of the government." Katherine Anne Porter is the famous short story writer, feminist, and socialist who later in life argued for separating art and politics. 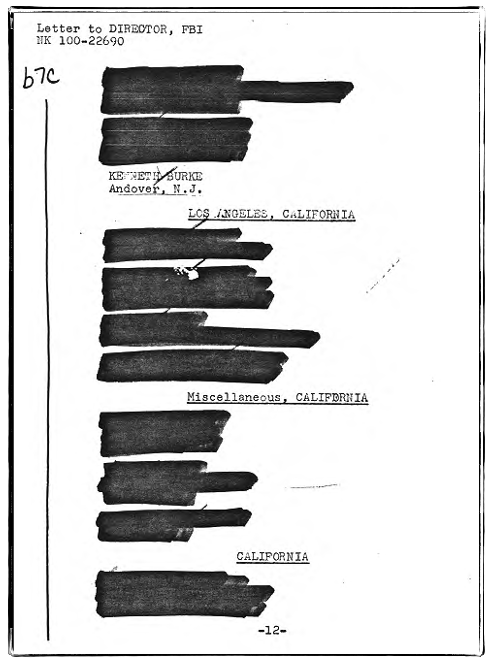 Burke would have loved this page from the files. His is the only name not blacked out. b.7.C: "could reasonably be expected to constitute an unwarranted invasion of personal privacy." 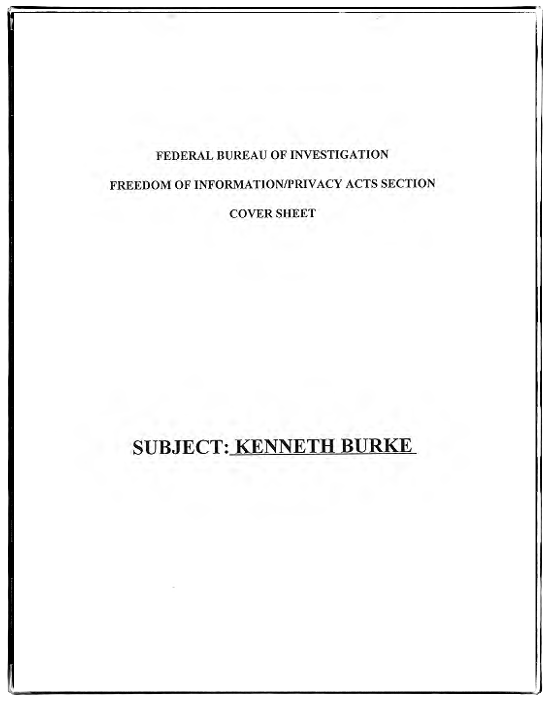 b.7.D: "could reasonably be expected to disclose the identity of a confidential source, including a State, local, or foreign agency or authority or any private institution which furnished information on a confidential basis, and, in the case of a record or information compiled by a criminal law enforcement authority in the course of a criminal investigation or by an agency conducting a lawful national security intelligence investigation, information furnished by a confidential source." Yet again, three more pages have been withheld from this location in the file because it has been deemed that releasing the information would violate someone's right to privacy. 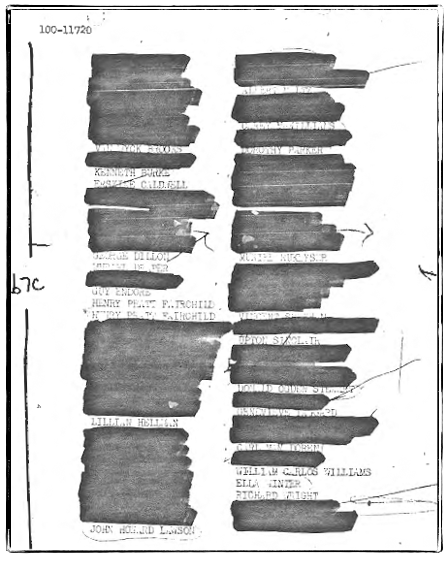 In sum, nine pages of material have been withheld, which is roughly one-third of the entire file, all from the period between the previous entry (1954) and the next, which is from 1956. That period was, of course, during the height of the McCarthy frenzy in the United States, a time when hundreds of thousands of civilians were being recruited by the U.S. Air Force as plane spotters amid fear of an invasion by the "Red Menace." Burke was during this period producing work for The Rhetoric of Religion and for his Symbolic of Motives, which he still planned to complete and that only appeared in fragments in other works, such as Language as Symbolic Action (1966), until the posthumous publication of Essays Toward a Symbolic of Motives, 1950–1955 in 2007. The next two documents concern Lily Batterham, who was Burke's first wife and the sister of his second wife, Libbie. According to the record, Burke and Lily were officially divorced in 1933. 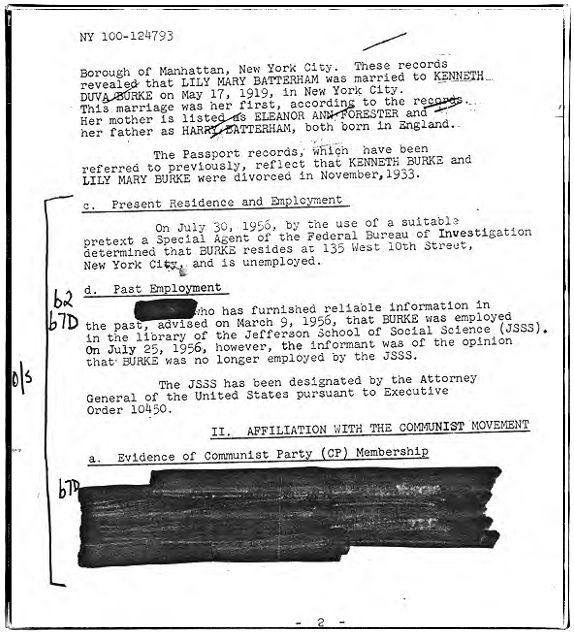 The FBI believes that Lily was a member of the Communist Party. 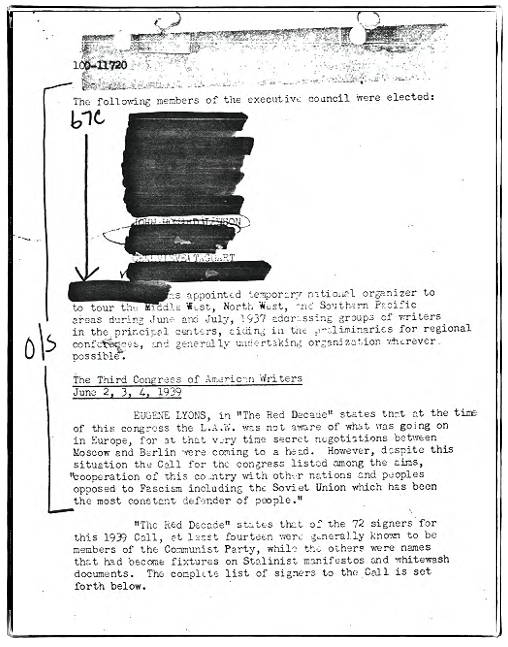 Burke himself claimed that he was never a card-carrying member, and nothing in the FBI file seems to contradict that. JSSS stands for "Jefferson School of Social Science." 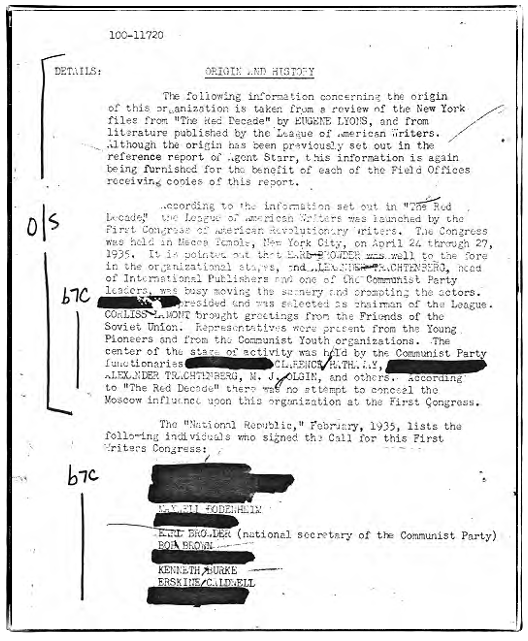 The Jefferson School for Social Science was designated by the Attorney General as having "affiliation with the Communist movement." 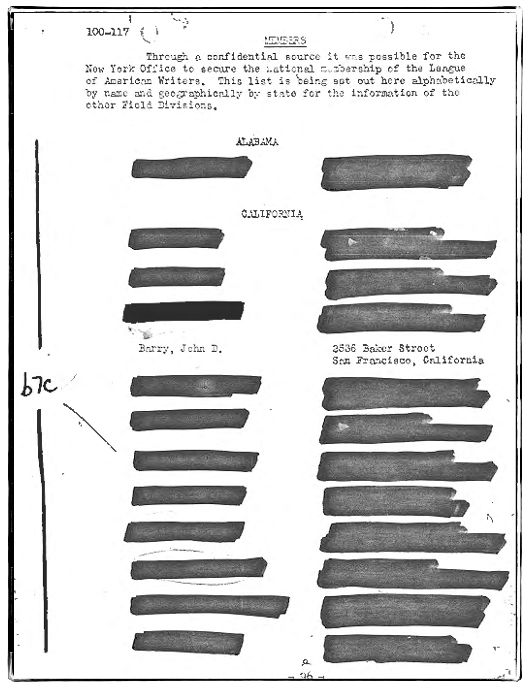 The evidence for that has been blacked out, and the document ends here. From the late forties on, Linus Pauling, as a member of Einstein's Emergency Committee of Atomic Scientists, actively sought to educate people about the dangers of nuclear war. Pauling won the Presidential Medal of Merit in 1948 and the Nobel Prize for Chemistry in 1954. According to his Nobel biography, in the early fifties and again in the early sixties, he encountered accusations of being pro-Soviet or Communist, allegations which he categorically denied. 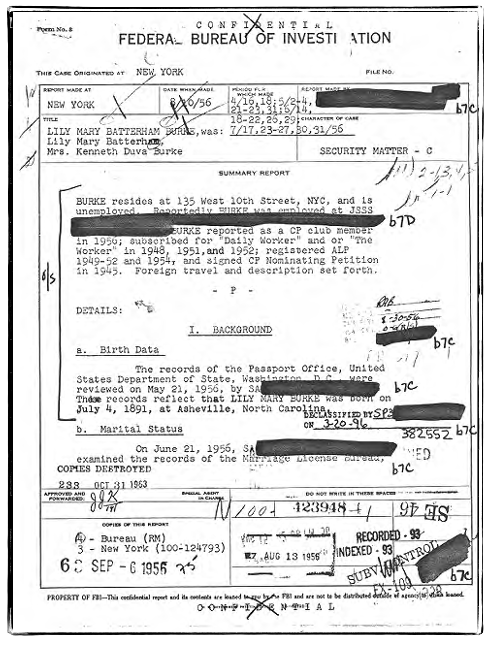 For a few years prior to 1954, he had restrictions placed by the Department of State on his eligibility to obtain a passport. This Peace Rally took place in 1961. 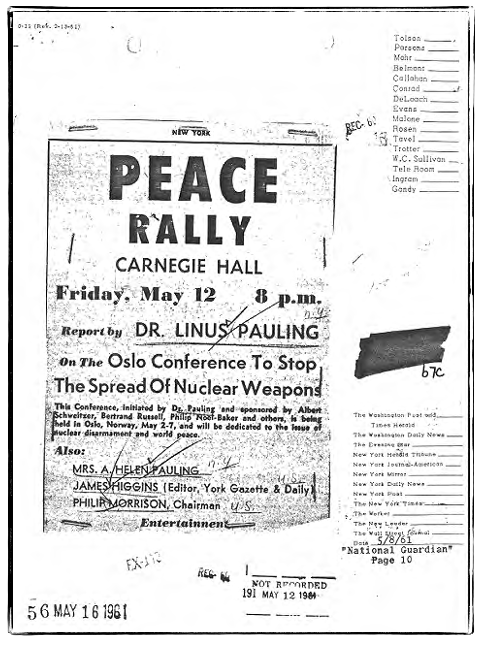 In 1962, Pauling won his second Nobel Prize (the only person ever to win two) for his peace efforts. Interestingly and because of a technicality, Pauling didn't officially receive his high school diploma until 1962. The list of sponsors of this event appears on the next page. 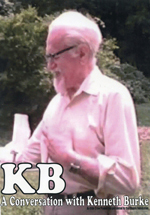 "Prof. Kenneth Burke, Andover, N.J." is the seventh name down in the lefthand column. Meanwhile, weather permitting, I sally forth with my scythe each afternoon, to clear the weeds from the fields about the house. I have driven the wilderness back quite a bit, since the last time you were here (at least in some places, though it is patient, and ever ready to catch me napping, and move in here as soon as I go there). So, while scything, in a suffering mood, I worry about our corrupt newspapers, about nucleonics (for where there is power there is intrigue, so this new fantastic power may be expected to call forth intrigue equally fantastic), about things still to be done for the family, about a sentence that should never have been allowed to get by in such a shape. (Beineke Rare Book and Manuscript Library, Yale University). 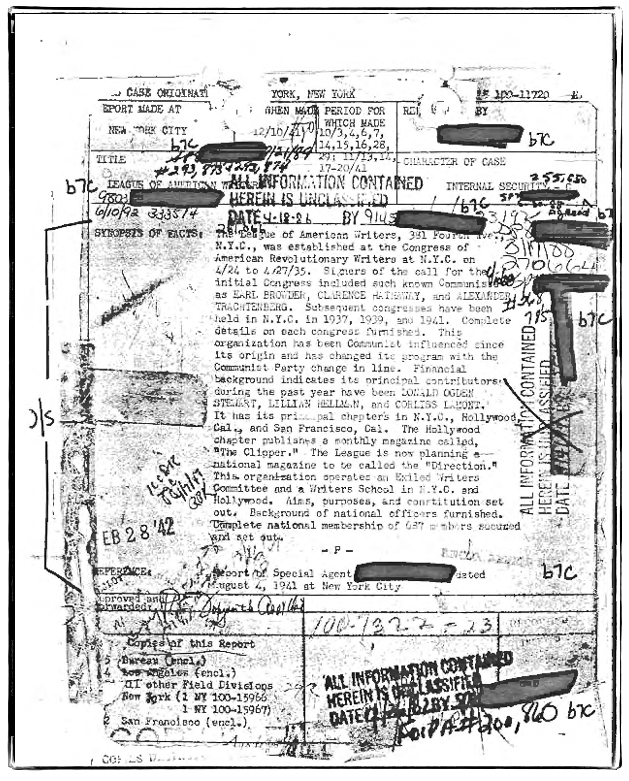 Todd Deam was the project coordinator who acquired Burke's FBI Files and transcribed them for publication in PDF format. David Blakesley prepared the images for web publication and wrote the running commentary. Kathy Elrick also prepared some HTML files and images.